12 In. Probe is Standard. Other Lengths Available. OMEGA’s High Temperature Surface Probe features a thermocouple alloy spring-loaded sensing element to ensure consistent readings. 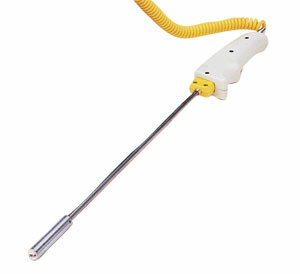 The twelve-inch probe comes with an SMP Male Connector termination and a 0.3 mm (1 ft.) retractable sensor cable (stretches to 1.5 m (5 ft.). Available in thermocouple types J, K, or E, the HPS-HT probe can measure temperatures up to 1100°C (2000°F), type K only.